one hour and twenty-one minutes. 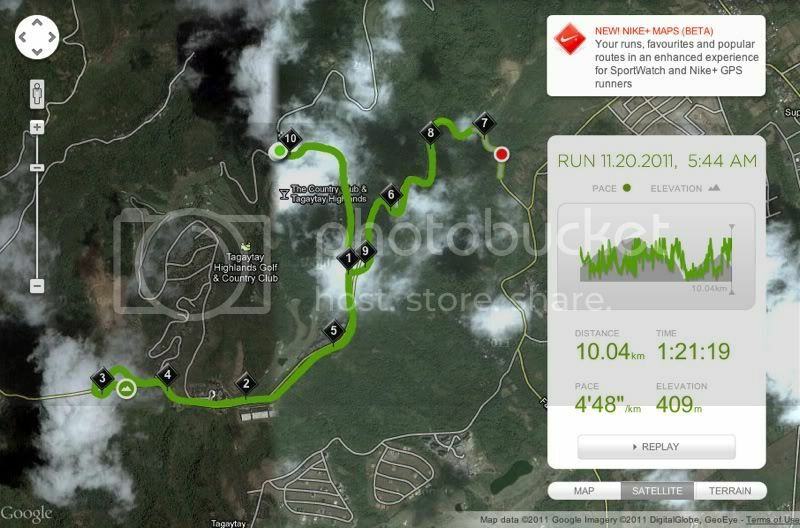 that's how long it took me to finish 10 kilometers in the nathan ridge run at the tagaytay highlands yesterday. it is also my slowest time on record in that distance, certainly the worst since i started my training as a run-up to the standard chartered marathon singapore this december -- but i couldn't be more proud of that time. it's because the race course of the nathan ridge run was no ordinary route. 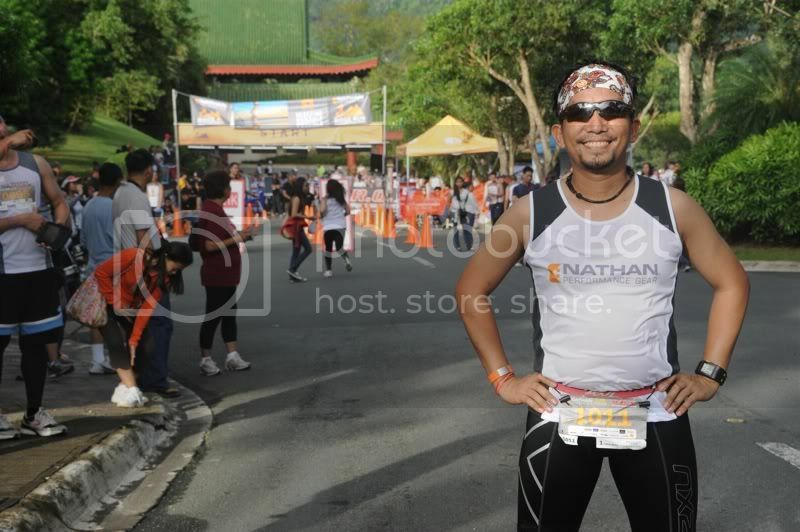 it was a battle: uphill in the first 3.15kms, a crazy downhill until the 7.4km turnaround, which meant a heart-stopping, cramp-inducing climb until 9.1km, and a descent which snow-balled into my strongest sprint-to-the-finish in memory. the night prior to the run, i was coaxed by kuya mar to drinking too many bottles of beer that kept me awake until past 1am. sir manny told me that at least we would have an excuse the following morning if we faltered in the race. i replied saying that i was just running a 10. not 21 as everyone else was. but it proved to be a burden in the first 28 minutes of the run. i'm used to hills and steep inclines. but i don't normally run up them. nevertheless, it was difficult for me to start off kicking since i felt heavy and i found myself walking through the dense tagaytay fog only after 10 minutes. besides, the views from the roadside were fantastic. the sun was just rising, and the creeping light bathed the mountains of makiling, banahaw and maculot with an eerie golden aura. dawn shimmered in the taal lake down below and i regretted not having a camera. in my category, several kids were snapping pictures of themselves. some even had entry-level DSLRs -- normally i'd think that was crazy, but i've done it before. on the way back from the lookout at 610masl (we started at 405masl), the mountains were sentinels of stillness crowned with veils of fluffy white clouds. i kept pictures of the views in my mind, as i leaned back on the descent, hoping my hesitation won't send me tumbling down. at times, i would zigzag along the road, or run sideways, since i knew neither my weight nor the reverse-incline was friendly to my old, brittle knees. nevertheless, i caught up with the horde on the return, and particularly during the turn into the midlands. on the way back up, i was imagining how difficult this must have been on a bike, lengthening my strides on a long walk because i thought running was impossible -- until aging, who finished 3rd overall, passed me, shuffling his fast legs as though he wasn't going against gravity. 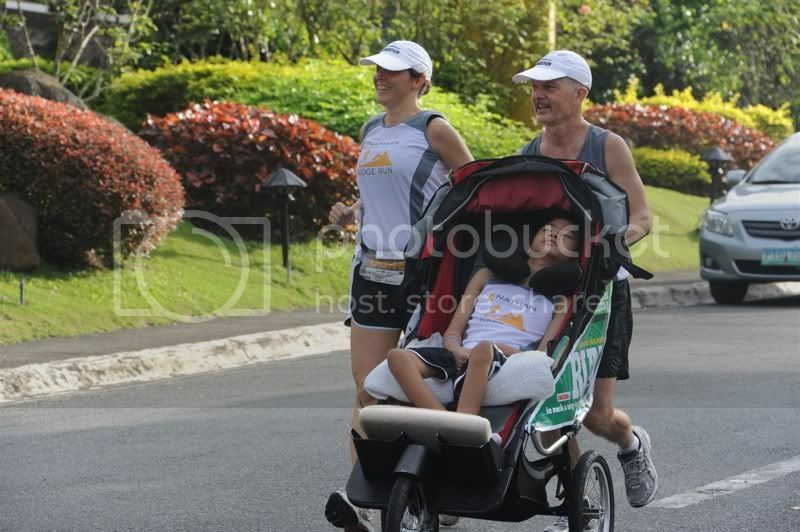 finally, i had less than 1 kilometer left and i practically rolled to the finish line. there was only a limited number of medals for the 10K finishers, but i didn't mind not crossing early enough to get one. i was mighty proud of what i had just done. almost immediately, i collected my bag and waited for my friends who were crazy enough to attempt the half-marathon distance given the conditions. they came few and far between. i saw kuya mar on the curb, plastered by lack of practice and a hangover. he was in the 21K category, and was gullible enough to even attempt it in his state, but not insane enough to push through with it. he DNF'd himself and went for a piss on a wall. i worried that a guard might collar him. then he asked me whether there was a finisher's medal in the 21K. i said yes. he said he wanted to get it as a souvenir. and i said: it's a finisher's medal. for finishers. he said he didn't care. that he paid for it. you didn't pay for it, i replied. we got our bibs for free. but he was incorrigible. i was aghast. i dissuaded him by saying that he didn't have enough bands from the turnarounds to rightfully claim that he had completed the race. 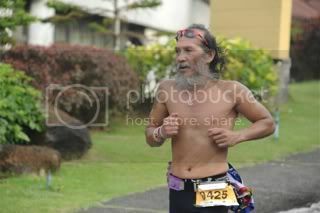 but doc came along and kuya mar "borrowed" the rainbow bands, and despite my criticism of his act of wholesale deception, he waited for roy and orland to come along, splashed some water on his face to look like he just had a workout, and ran with them to the finish line to collect his souvenir. and this is why i'm not a huge fan of finisher's medals: they don't recognize exemplary achievement. they're just oversized keychains. overall, i really enjoyed this run and won't mind running it again next year. normally, i despise overpriced runs, but the race fee was so worth it, i'm not even sure if R.O.X. made a profit. all paying racers got nathan bottles. there was a post-race meal (it was in a small, pathetic box, but hey! great gesture!) in an airconditioned hall. and a free shower at the club house. plus free entrance to an otherwise exclusive community. what more could you ask for? truly, it was the road, redefined. now have a goal of improving on that 1:21 time. some people think i'm either fit or crazy because of the things that i do: i climb mountains, bike on off-road trails, run short- and middle-distance races. that's because they don't have the kind of friends i do. compared to them, i'm nowhere near being fit. and following this intense weekend, i'm not even half-crazy just because i run up and down hills. on top of what we have in common, they also do many other things, like multi-sport races. i've dipped my fingers into that with near-disastrous results, but i'm not sure if their decisions were admirable or signs of clinical insanity! 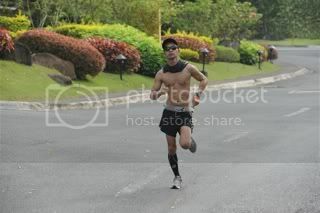 on saturday, i was hauled to santa rosa to take pictures of my friends participating in the powerade duathlon in nuvali. 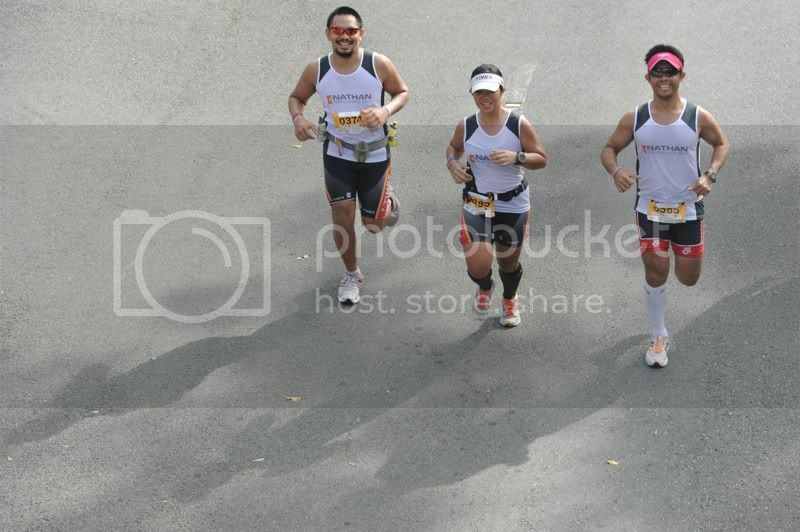 10K run, 40K bike, 5K run. i did half that distance and i can tell you that it's no joke (more so when you're pedaling a mountain bike). several of my friends joined and they all acquitted themselves particularly well. janice, roy, laarni, and tatax all placed in their respective age categories. 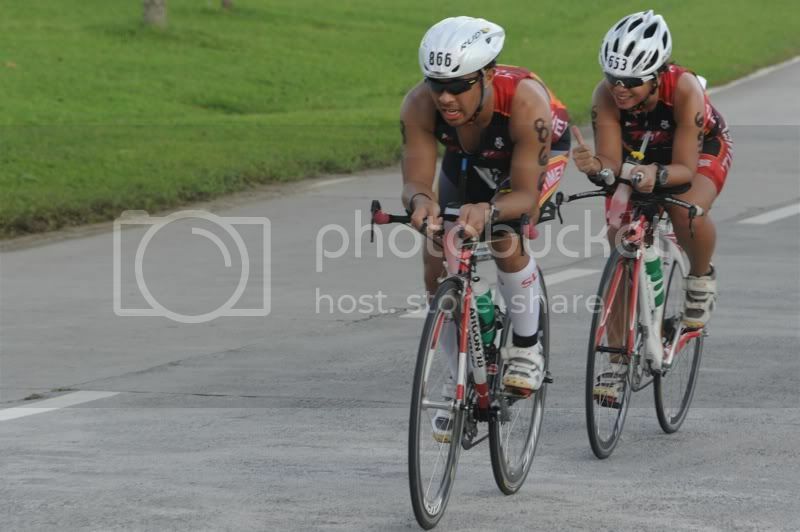 joven, who is baptizing himself into the world of multi-sport racing, missed the cutoff by a few minutes, but is on his way to duathlon redemption. i really must get back on the saddle! no one i know would consider a half-marathon on a race course such as the nathan ridge run can be considered a recovery run, but these guys -- janice, ian, carlo, and roy -- just did. and they still finished in good time with neither shame nor injury! 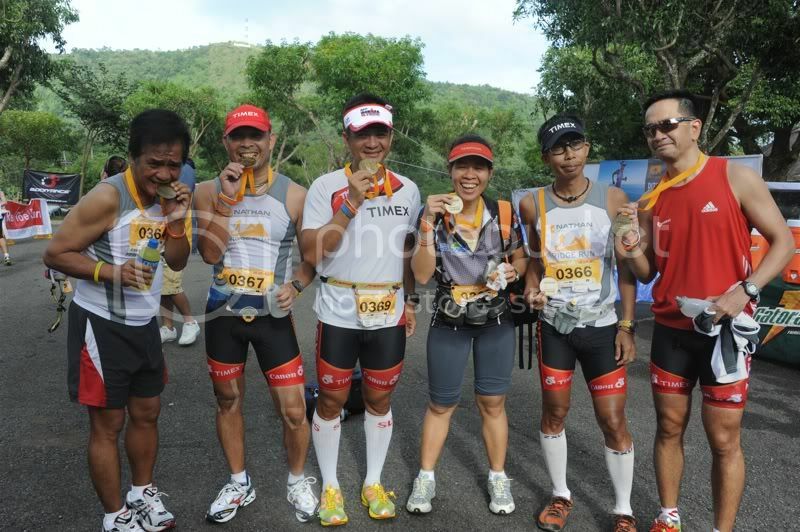 even their fellow duathletes were amazed. yeah, we're crazy like that. at least they are.